It's hard to imagine, but Hudson has climbed over 30% from the bottom for home prices. 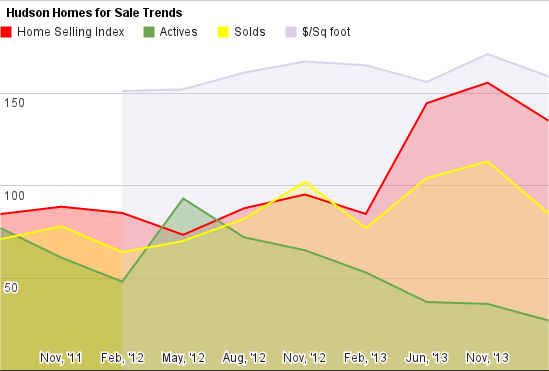 Low inventories means there's prices will continue to climb. 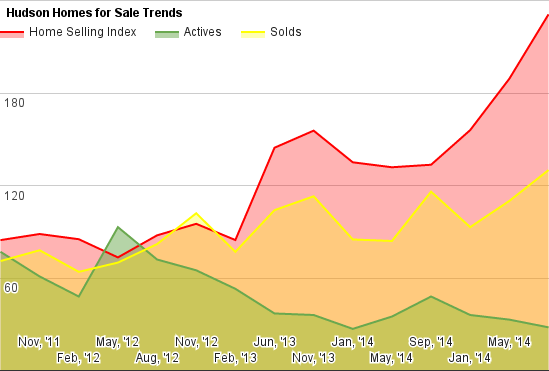 Sellers are asking more - but staying close to past sales. 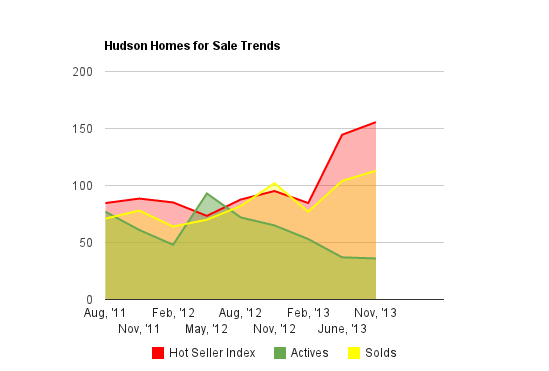 If the market gets much better in Hudson for sellers, it'll be on top of the "hot list" for towns - if it's not already. Hudson is having a great year if you're a home seller. If you're a home buyer, not so much. Hudson has a very interesting report. 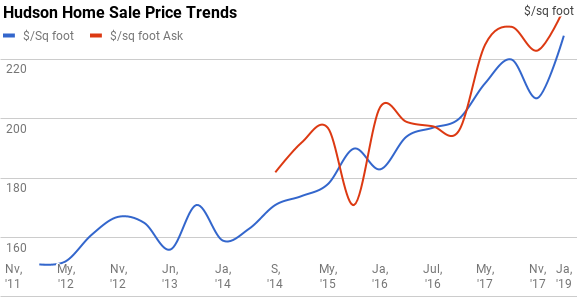 The overriding factor is the limited number of homes for sale - the lowest ever - which has been continuing the trendline started in May of 2012. But there are some other interesting aspects. 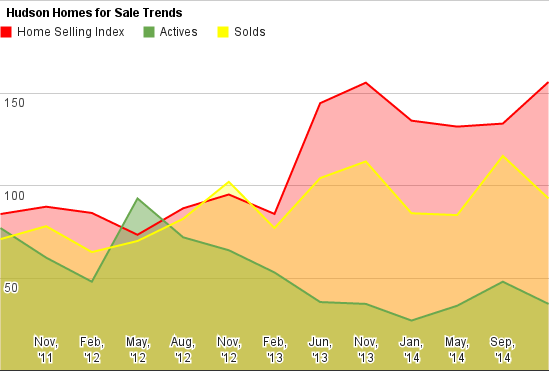 Hudson sets a record for home sale strength, and Sellers rejoice! Hudson had a terrific spring. 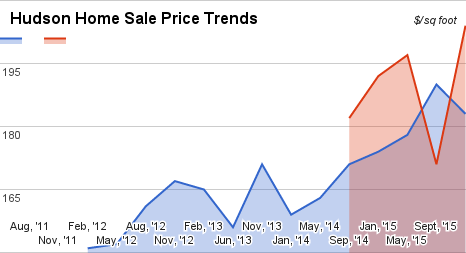 Buyers saw value and sellers raised prices, so everybody was pretty happy. Hudson hits an all time high with it's HSI, at 156. It's been here before in November of 2013. 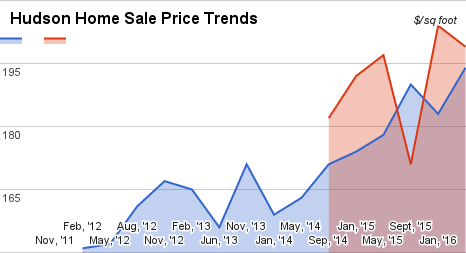 It means things are tight - and good for sellers - and that's not likely to change quickly. What to make of the Hudson report? Things are not adding up in this report, which is certainly not the norm. Is this the start of a larger trend? Is it an outlier? Let's see what we can figure. Hudson sets a town record for the HSI, with a sharp increase to 156, up from the 144. Let's see how they got there.